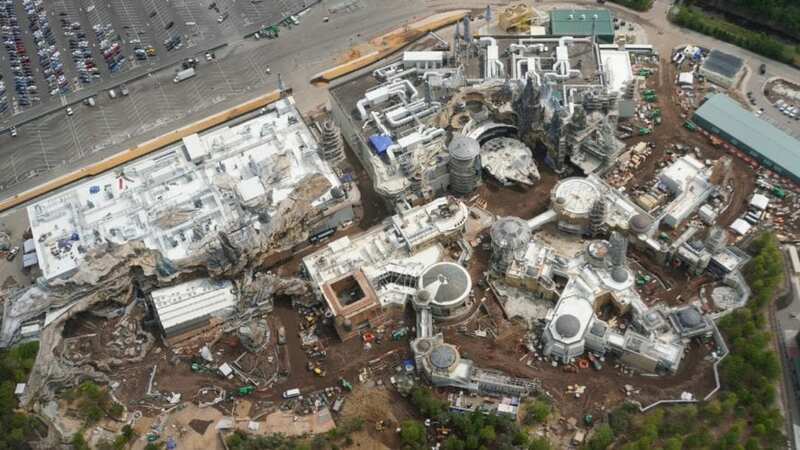 Seen here is basically all of Star Wars: Galaxy’s Edge. There are tiny sections, like the walkway entrance from Grand Avenue, that are missing, but this is primarily the whole land. We can see that the Millennium is complete! Take a look at the parking lot in the background. Now imagine those cars, or even the transport truck, next to the Millennium Falcon. Huge! Zooming into the center of the previous image, we can see concrete work near the Ronto Roasters building on the left and Dok Ondar’s Den of Antiquities on the top and center areas of the image. And here we have a zoomed in look at that same building. I for one am happy to see the elevation changes throughout the land. These rising and dropping areas will create a better sense of realism as guests have to travel through and explore the land. 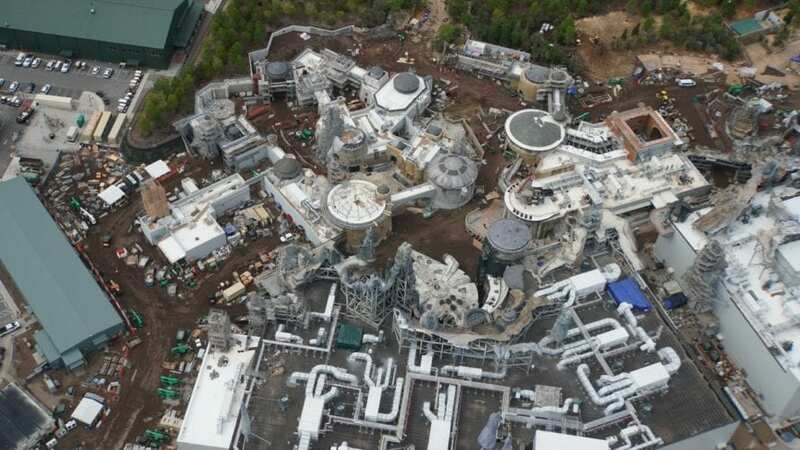 Looking back a bit, we can get a great look at most of the city portion of the Black Spire Outpost. 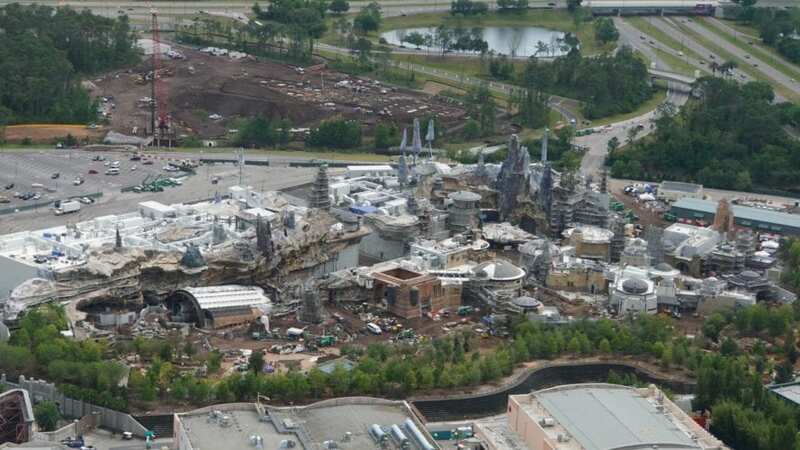 On the left, near the open-roofed buildings, we expect to have the Black Spire Outfitter’s shop, the Creature Stall, Toydarian Toymakers and Ronto Roasters. The smaller red and tan spaceship is sitting atop Docking Bay 7, a quick service food location. 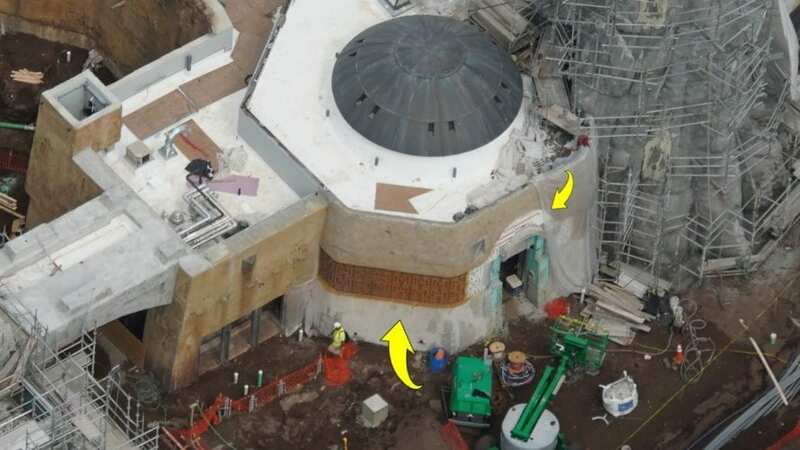 In the center portion we supposedly have Dok Ondar’s, the Droid Depot and the Milk Stand. 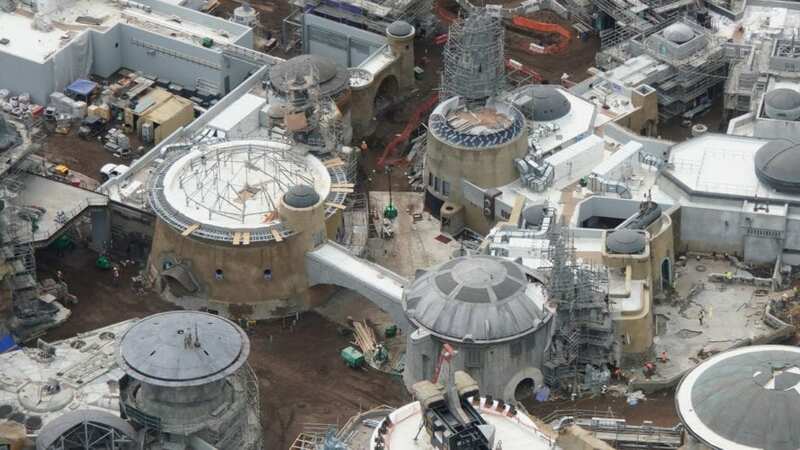 Whereas, the collection of structures on the right, starting at the domed building near the Millennium Falcon, we have Oga’s Cantina, the First Order Cargo store and the eventual placement of the TIE Echelon. Speaking of the TIE Echelon, here is where it will go. 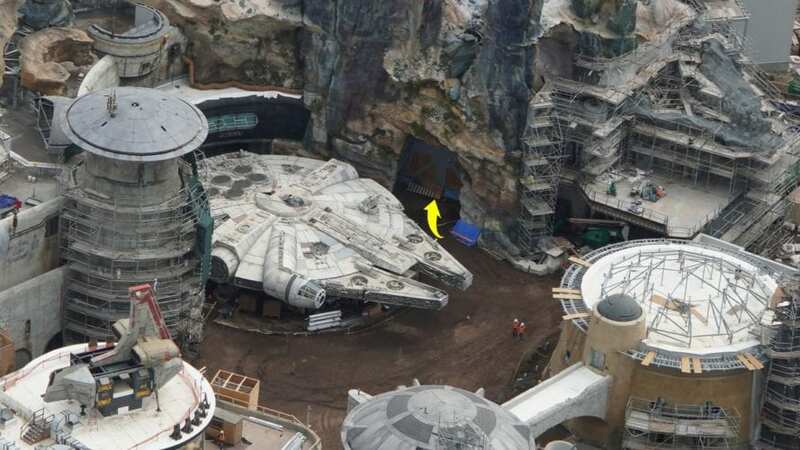 This ship will be seen for the first time ever in Star Wars: Galaxy’s Edge. But, with its priority in the land, it is assumed it could play a big part in the upcoming Episode 9 film as well. Near the TIE Echelon (you can just barely see its concrete pad on the very bottom of the screen), we can see where Disneyland will have both of its entrances on one side of Galaxy’s Edge. The major difference between the Disneyland and Walt Disney World versions of this land is the way to enter. Disneyland will have three entrances, where Walt Disney World will only have two. The Walt Disney World version will also only have one tunnel entrance, which will take guests from Grand Avenue. 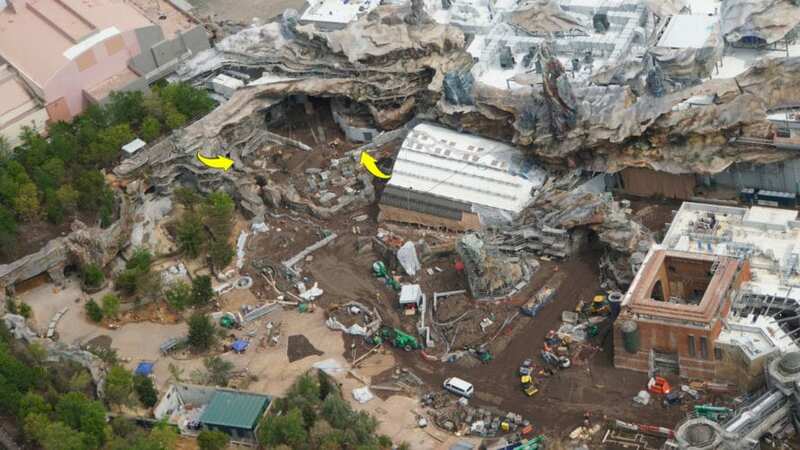 Whereas in Disneyland, all three entrances will be tunnels. Seen here on the top right, there will be an open-air walkway from Toy Story Land into Star Wars: Galaxy’s Edge. It is assumed that this will be the only exit at first, with the Grand Avenue pathway being the only way in. This was done in Pandora: The World of Avatar when it opened to help ease foot traffic. 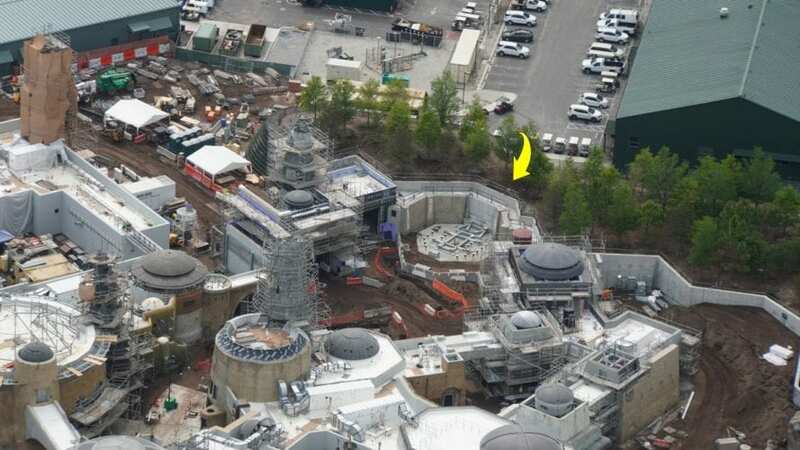 Zooming back out we can see that concrete pad for the TIE Echelon on the top left near the Toy Story Land entrance. We can also see the two rather large go-away-green backstage buildings on the left. It is currently unknown what the purpose of these buildings are, but it could range from food and merchandise storage to break rooms and office space. When we look at the Millennium Falcon’s resting place we can see a new bit of detail on one of the barrier doors in the back. I recently read Pirate’s Price, a prequel/sequel book about Hondo Ohnaka and his role with the Millennium Falcon. SPOILER for the book, near the end of the story Hondo has ownership of the Millennium Falcon and has it in the Black Spire Outpost (the town in Star Wars: Galaxy’s Edge). Hondo is speaking to a client who wants to purchase the Millennium Falcon and takes her to where we see it resting now. With the press of a button the ship is revealed with a flurry of moving boxes and scattering droids. It is assumed that is how the Walt Disney Imagineering team will explain how we see the Millennium Falcon outside but why we don’t get to board it there. Perhaps the ship revealing mechanism can bring the ship down to a loading dock and that is where we will board. I had to include this image to talk about some thoughts of mine that you may share as well. 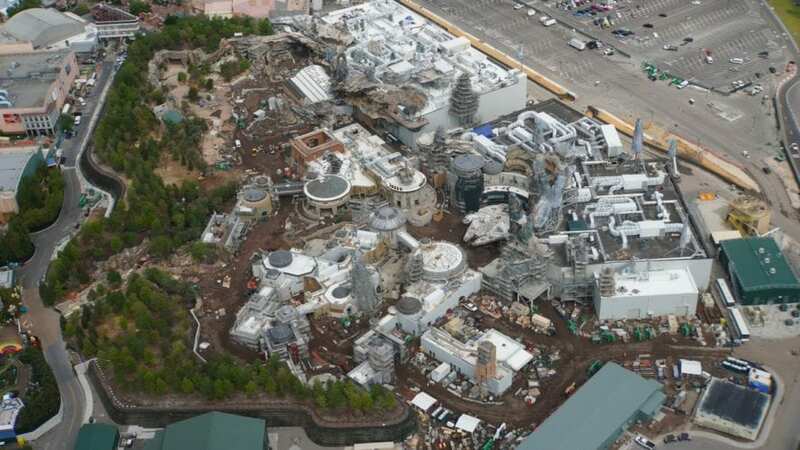 The domed building in the center is expected to be Oga’s Cantina. From this image, especially when seeing the empty backstage portions, it appears kind of small. But, that is where sizing and comparisons once again are helpful. Look close, zoom in if you have too, those two white specs are human beings. In fact the Millennium Falcon is over 100 feet across. And, with numerous places to eat and drink, the land will help spread the crowds. out. A second point I wanted to talk about was the ease of expansion. Clearly Disney has no problem with land phases. So, who says that phase two, the opening of the Star Wars: Rise of the Resistance attraction, will be the last phase? 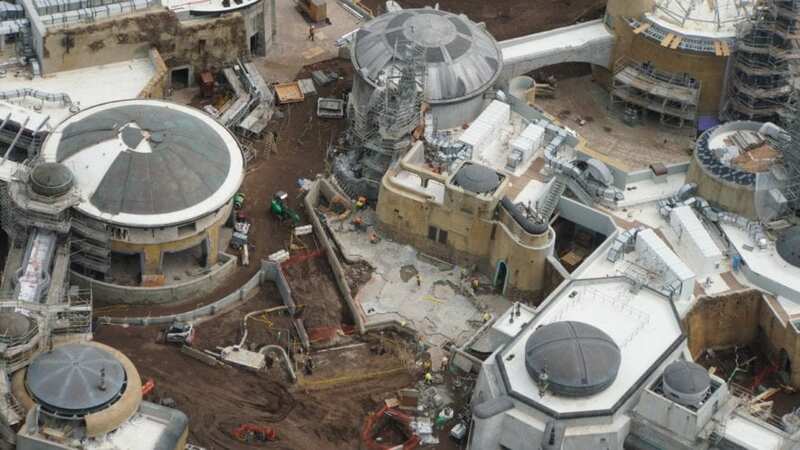 We can assume that the Star Wars Hotel will be another phase of its own. Why not have numerous phases then? Looking at the right side of the image we can see archways that lead to nowhere. While this may be far off in the future, this area seems like an easy place to build a few new shops or perhaps some new entertainment. And, Disney could build it with relative ease without guests noticing. Then, upon completion, just knock down the dividing wall and welcome guests to a new phase of the land. A close look at the bottom right of the previous image takes us to this smaller structure. On its right we can see the basis of another petrified tree. We have heard rumors that this is the official black spire of the Black Spire Outpost. If rumors are correct, there will be a magnificent photo opportunity with this spire that will allow a picturesque view of Galaxy’s Edge to be in the background. If we spin around and look at the other side of the black spire we can see an archway connecting Oga’s Cantina (left) and Don Ondar’s Den of Antiquities (right). Much like I had suspected before, it appears that some of these walkways are not for guests, or even completely fake. The cutout in the tan exterior appears to not reach the ground. This may be a simple fake-out bridge to add height and mystery to the land. Here we have another bridge which may or may not be actually useable. We will have to wait for the scaffolding to come down before we tell if this walkway will be real. This shot also gives a great look at the nearly completed open-air market. Rumors suggest this orange-ish building to be the Creature Stall where guests can purchase Porgs and other exotic animals. Thanks to the Disneyland images, we already know what to expect in the areas pointed out. The left arrow is pointing toward Poe Dameron’s custom orange and black X-Wing fighter. 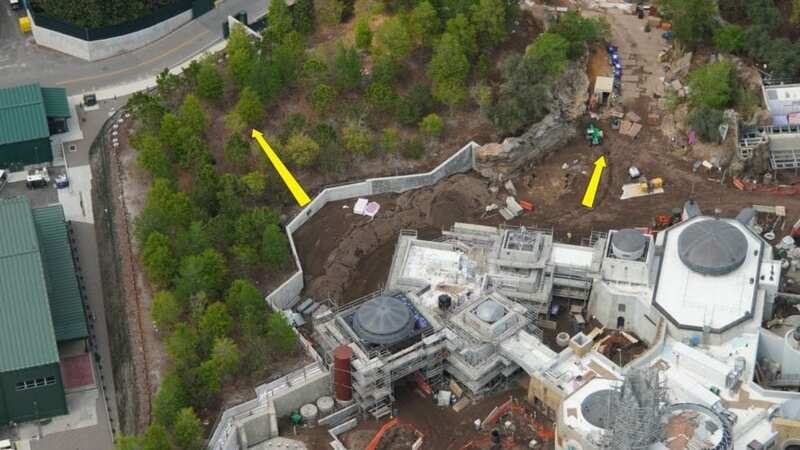 The right arrow is pointing to the eventual placement of the blue transport ship that will take guests to the Star Destroyer in the Star Wars: Rise of the Resistance attraction. 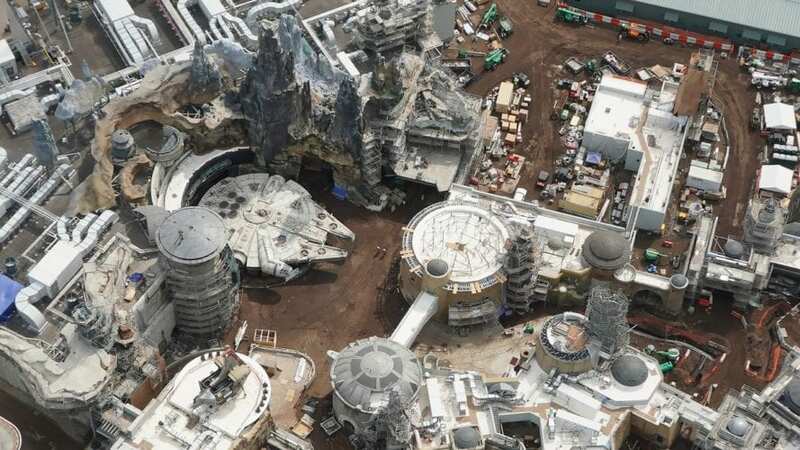 And that is Star Wars: Galaxy’s Edge, as we currently see it, in Disney’s Hollywood Studios at the Walt Disney World Resort. 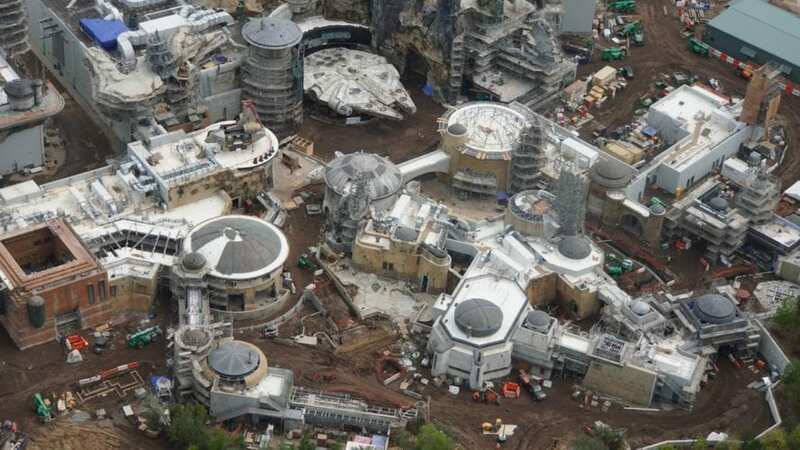 But, that land is not the end of the Star Wars fun coming to Walt Disney World. 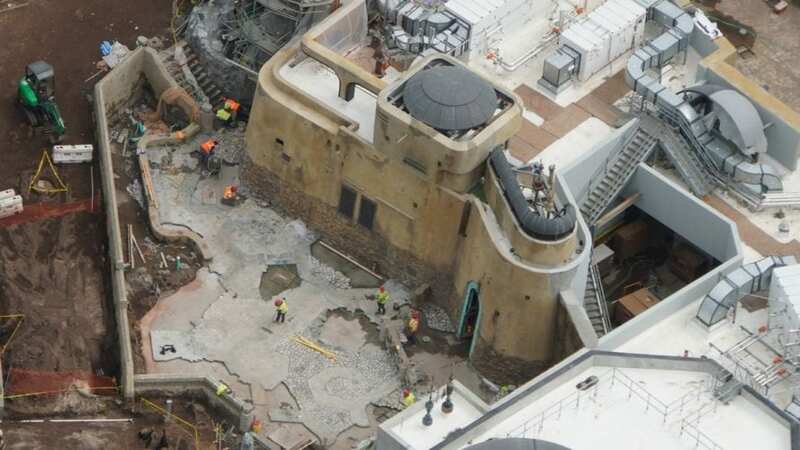 The large patch of dirt being worked on in the background is the beginning of the Star Wars Hotel that is expected to open before October 2021. The Rebellion is reborn (August 29th). The (theme park) war is just beginning. And I will not be the last (Star Wars Expansion). 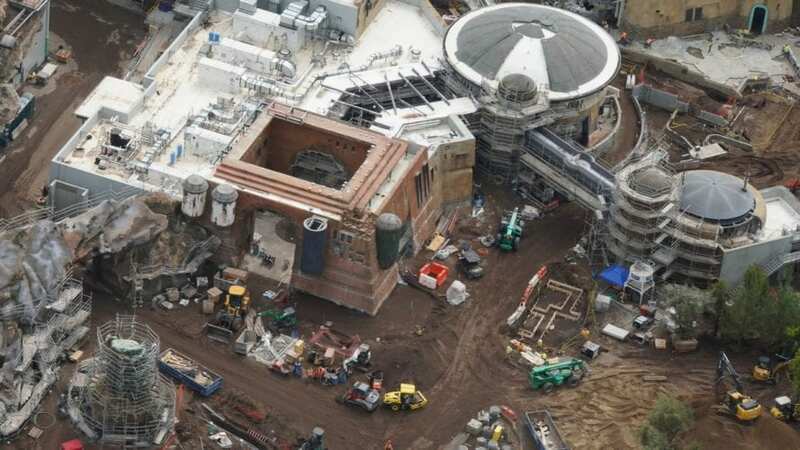 Want to learn more about Star Wars: Galaxy’s Edge? Check out these links and videos!